Like the distracting “Hey you guuuuys” shouted into the pirate cave of show business, talk of a sequel to The Goonies is once more echoing across the Internet, after producer Richard Donner again asserted that a follow-up is in the works. 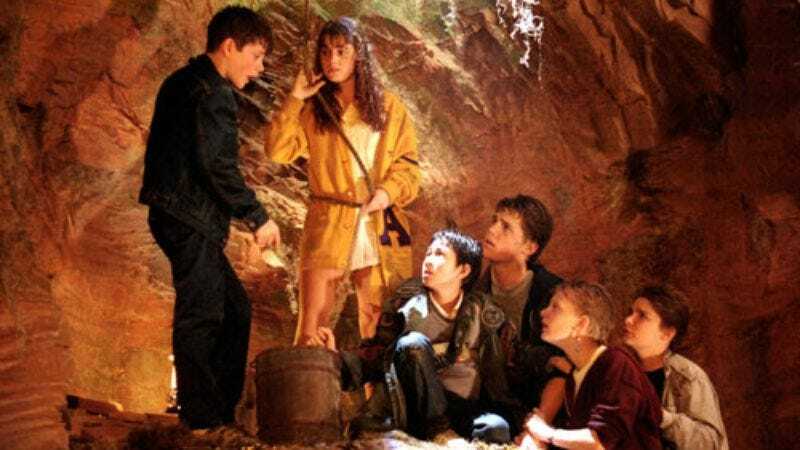 Of course, such talk is nothing new: Donner has said for years that he’d like to make another one, with Sean Astin chiming in intermittently that it’s a certainty, and Corey Feldman telling The A.V. Club in 2012, “I say that there’s always hope until we’re all dead,” in one of the most unintentionally ominous endings to an interview ever. There’s also the fact that Donner was essentially pressured into saying it this time, responding to a TMZ badgerer’s question of whether he’d ever make another comic-book movie with, “If you call Goonies a comic book. We’re doing a sequel”—which is just the sort of thing any one of us would say if we were trying to get to our car. Nevertheless, Donner’s offhand declaration sparked the usual frenzy among those excited to see what their favorite child adventurers are up to 28 years later, likely because they haven’t thought that through. And according to the understandably skeptical Jeremy Smith at Ain’t It Cool News, there may be actual reason to anticipate a middle-aged Chunk, long since shamed into weight loss, shuffling his now-emaciated truffle. Smith’s sources tell him Goonies 2 is “very real and on the fast track to production,” with Spielberg and Donner “actively looking” for writers and a director to draft a new film that would “focus primarily on the kids of the Goonies,” with cameos from the original group. Many haven’t been seen in a movie in years, though that certainly hasn’t stopped Feldman from making them. Anyway, the AICN report folds the Goonies news in with the similarly oft-repeated rumor of a Gremlins remake, saying Warner Bros. is also “moving quickly” on that (presumably before the children of the children of the ’80s become too old for their parents to drag them to the reimagined relics of their own increasingly distant youths). Neither project is officially confirmed, currently existing only in the bottom of the nostalgia wishing well—where someone’s long-ago dreams that never came true are just coins waiting to be scooped up.